I have Nokia N78 phone and use it a lot for surfing web (with beautiful Opera Mobile 10), reading RSS (with internal webkit-based browser), tweeting (with awesome Gravity client), reading CHMs (with great mobiCHM tool) or using Skype, or doing and many other tasks. But mostly I use the phone to read something on the internet when I’m on the way to some place (as it takes at least an hour to get somewhere in Moscow using public transport). And usually when I’m browsing web on a PC and find something worthy to save to mobile, I type its URL on the phone and save it to bookmarks. Which, even with bit.ly or any other url-shortening service, is a kerfuffle, and T9 doesn’t really help here. 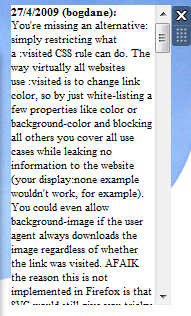 So I was trying to find an easier way to get URLs transferred from my PC onto the mobile. Opera 10 Mobile comes with Opera Link bookmarks synchronisation service, but I don’t surf internet in Opera on a PC. There’re some social bookmarking sites, but I’m not adding every link that I want to read on mobile to my bookmarks, be it a web-service or browser bookmarks. And here comes QRCode scanning to the rescue. I knew that Nokia provided a nice free easy-to-use QRCode scanner for their smartphones, and I gave it a go. Downloaded, installed, tried with some QRCodes I had, everything was fine, scanning and recognition speed was really high – I just pointed the phone camera onto my computer’s screen and the encoded text was momentarily recognised. I decided to try encoding links in QRCodes using Nokia service, and it worked fine as well – the scanner made them active so I could either copy them to use in Opera Mobile or open with default web-browser (handy if it’s a link to RSS feed). Of course, encoding each link manually and then scanning resulting QRCode is taking much more time than just typing the link in the phone, so the idea of making the browser show QRCode for any link made more sense to me. Bit.ly is used to make QRCode creation faster and easier as only small chunk of data is encoded. And then just uploaded the php script and my accelerator to my site. Dead easy, 10 minutes job. Then you just run Barcode app on the mobile, get the QRCode scanned and then can do anything with the link – copy it to the clipboard, open right now in the default browser. Seems to be quite handy. In order to get this accelerator in the main right-click menu, you need to go to Page –> All Accelerators –> Manage accelerators and in the window that appears select “link QRCode” accelerator and press on “Set as default” button. So now you can get a QRCode for any link, scan it and use it on your mobile. P.S. There’re QRCode scanners for all mobile platforms, so if you want similar functionality on your phone, google for “QRCode scanner %yourphone%”. I’ve just watched MIX keynotes and as soon as MSFT announced there was free VS2010 Express for Windows Phone 7 with proper emulator, I downloaded, installed it, created sample app and ran the debugger. The most interesting thing for me was to find out which IE version Microsoft decided to ship with Windows Phone 7. They said it wouldn’t be IE9, but would be something between IE7 and IE8. They also assured that the Windows Phone emulator (which comes bundled into the VS2010 Express for Windows Phone 7) is a proper virtual machine, a real copy of Windows Phone OS sandboxed in the VM engine. 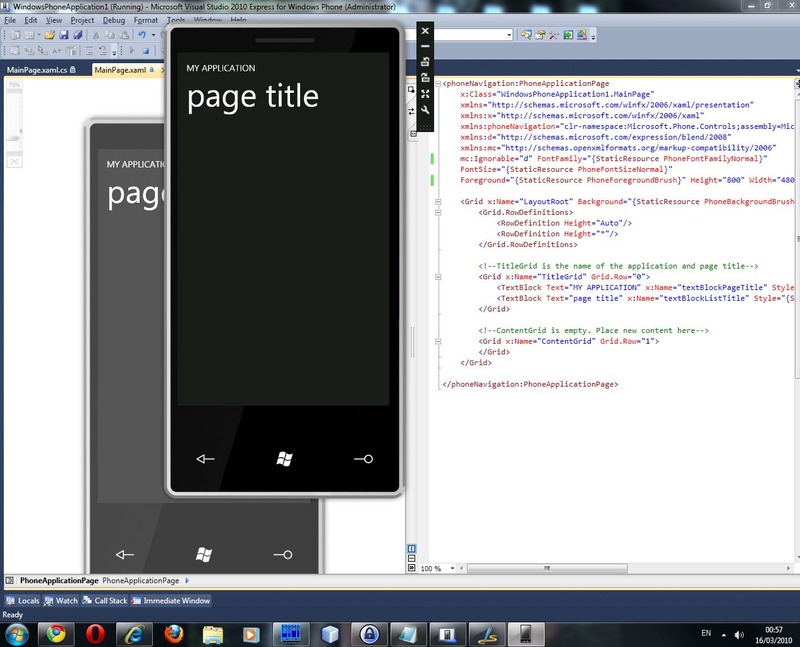 So bearing this in mind I thought that I’d test the WP7 IE in emulator. So from the CSS prospective Windows Phone IEMobile 7.0 is indistinguishable from desktop IE7, it applies the same conditional comments rules, supports the same subset of CSS selectors, same hacks work and same bugs are there. If you know how to support desktop IE7 Trident, you won’t have a problem with IEMobile 7.0. So from what I see now, Microsoft took IE7 Trident (3.1), took jscript 5.8 and cut off as much as possible (all COM wrappers and some native features), put IE8 icon on top and shipped it to Windows Phone 7. I really hoped it would have IE9 or at least IE8. The only hope is that it’s still beta and all the IE8 stuff will be shipped with the final version. Hope it’s not just a wishful thinking. It’s such a frustration to see a beautiful and free VS2010 Express for Windows Phone 7, awesome SL4 which runs everywhere, and then look at this crippled “IE7.234”. If this is a marketing choice to make web-developers write in Silverlight, then it’s silly because it breaks the most important feature Microsoft provided – backwards compatibility. Old sites and current sites which Windows Phone users will want to visit will break in this browser. Gmail works in html-only mode. Surely, some will adapt. But not all. And by the way, Apple got it right on iPhone. P.S. Todd Brix said there will be a Windows Update-like service in Windows Phone 7, so let’s hope that IEMobile will get updated. Windows 7 will be shipped without IE8 in Europe? As CNET states, Windows 7 will be shipped to Europe without IE8 because European antitrust regulators told them so. This clearly shows how rotten EU antitrust committee is and how easy it is for a well settled lobby to force the whole EU to accept absolutely stupid and nonsense act. Who will gain any profit from this? Hardware vendors? No, they were always able to install any browser on the computers they sell and make it the default one. Other browser vendors? To a degree. Anyway Microsoft will provide hardware resellers with an IE8 pack – so they can install IE8 on all the computers they build. Is there any sense at all in this decision? I can’t see it. I just don’t get it, really. If I’m buying a car, I won’t argue that the tyres on this new car are from Pirelli (or any other vendor). I will just change them if I don’t really like Pirelli, or choose another car which doesn’t have Pirelly. I’m not prohibited to change them. I’m just given the default one. And now compare this situation with Apple who clearly prohibits installing Opera on its iPhone. Because it would compete (and, obviously, win the competition) with their Safari browser. Why doesn’t EU antitrust committee look at this? Why don’t Opera take any action here? Firefox Build Your Own Browser – a poor copy of IEAK? Mozilla team recently announced that version 3.5 of Firefox browser will come with a bunch of features that will provide companies and individuals to build their own versions of Firefox. There’re a few reasons, Mike, why IE is so wide-spread in corporations. First reason is that it supports proper customisation through IEAK, second – if IEAK is not enough, IE can be fully configured through Group Policy, third – it supports ActiveX which is a must-have for building real intranet applications. Passport scanners, barcode readers, label printers, CCTV – all this hardware automation is done through ActiveX. So until Firefox becomes a real platform for building intranet web-applications and gains a proper customisation and integration with AD, it’s not going to be on the corporate market. For reference, read this blog post. This is the fourth post in "Exploring Windows Gadgets” series. In this post I’ll tell you about the flyouts. As it’s practical to have small gadgets which don’t take much of screen space, it’s not possible to display much information on them. That’s why Gadget Platform provides a way to add a flyout object to your gadget. In theory, flyout is supposed to present additional or detailed information about anything you choose. When you set show to true, flyout html will be rendered and its window will be automatically positioned depending on the content size and gadget’s position. Flyout provides two events – System.Gadget.Flyout.onShow which is fired when the flyout is shown and System.Gadget.Flyout.onHide which is fired when the flyout is closed. Note that you can also access main gadget page from the flyout by using System.Gadget.document property which is always available. Enough theory, let’s modify our Gadget to show only comments titles on the main page and render a flyout with comment’s content when title is clicked. The resulting files and the compressed gadget are here. This is the third post in Exploring Windows Desktop Gadgets series and it will be devoted to improving our comments feed reader gadget by adding settings storage functionality. Any desktop program has its own settings storage (ini files, xml files, etc.) or uses a global OS storage (registry). The reason I’m telling you about DOM Storage in IE8 is that I have a strong feeling that this DOM Storage is used by Gadgets Platform to allow storing settings data for each gadget. Settings dialog is a modal window which opens on top of your gadget. As it’s modal, the only way you can close it is to press OK or CANCEL button in its UI. Similarly to the gadget itself, settings dialog is a HTML page displayed by MSHTML. To add the settings dialog to our gadget we’ll have to create a HTML file, let’s call it “settings.html”. To save comments feed URL and refresh frequency, we only need two fields and couple of labels. This is what I came up with. There’s a complete reference of Gadget platform events and properties on MSDN, but for our simple case it’s enough to say that System.Gadget.Settings.read reads object from the storage by its name, System.Gadget.Settings.write writes object to the storage with its name and System.Gadget.onSettingsClosing event fires when the settings dialog is closing. Settings store is separate for each gadget so don’t be afraid that your settings names can be accessed from other gadgets. So in the window.onload handler of settings.html I try to get the data from the storage and set inputs values accordingly, and when the gadget is closing, I check if OK was pressed (e.closeAction == e.Action.commit) and if so, save inputs values into the storage. Dead easy. Save it as rss-comments.gadget to your computer and install it – you will be able to set comments feed URL (so you can start using it to watch comments on your own blog) and refresh frequency in seconds. In the next posts of this series I will cover flyouts, make the gadget look really slick with UI enhancements Gadget platform provides, show how debugging gadgets can be really effective and dive into more details of the Gadgets platform. Stay tuned for more interesting stuff! In this post (second in Exploring Windows Desktop Gadgets series) I’m going to dive deeper into Windows Desktop Gadgets platform and cover its security model and some limitations. First of all, let me repeat that gadget is a client-side web-application running in chromeless mode on your desktop. It’s similar to HTA but provides a whole new set of functionality and also has some restrictions compared to HTA. The MSHTML runtime is configured with the set of permissions given to HTAs or the Local Machine Zone security configuration. This rises a very important point – don’t install gadgets from non trusted sources. Or if you do, please inspect the code before you install the gadget. As Gadget runs under current user account, it won’t be able to delete system32 directory or do any other critical damage to the system. But it will surely succeed in deleting your documents or photos. And of course, as any other Microsoft technology, Gadgets can be fully controlled by Group Policy. For more information on Gadgets security please read this and this MSDN article. The main limitation to me is that there’re no modal dialogs. No alerts, no window.confirm, nothing. So if you want to do a quick debug, you have to dump data to the document itself or use a script debugger. In one of the next posts on this topic I will cover debugging gadgets. With this post I’m starting a series of posts about one great Microsoft technology – Windows 7 Gadgets. I’ve already created an introduction post earlier and I recommend you to read it to find out the history of desktop gadgets. But now I will describe the technology, its theory and practice in more detail. First of all, let’s get our hands dirty and create a simple gadget. One of the things that was always bothering me was checking comments to my blog entries. 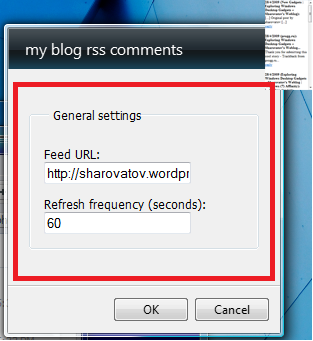 There’re usually two ways to check for new comments on your blog – either by subscribing to comments RSS feed or by going to admin web-interface of the blog and checking for comments there. I don’t like first option because I’m subscribed to more than a hundred feeds in my Outlook so I only read them at the weekends when I’ve got enough free time. And I don’t particularly fancy logging to my blog every three-four hours to check for new comments. 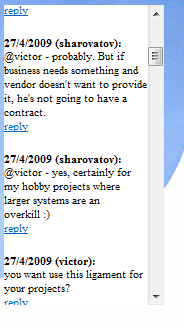 So Windows 7 Desktop Gadget with my blog comments feed would perfectly suit my needs. Although this might not sound as a killer app to you, but it does its job and also perfectly shows how simple it is to build a gadget. meaning that every five minutes getRSS function is called. getRSS function creates XMLHTTPRequest object and sends HTTP GET request to https://sharovatov.wordpress.com/comments/feed/. It takes 15-20 minutes to write such a tiny piece of code. 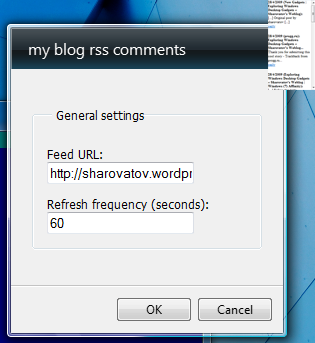 So now we’ve got a small web-application which is a very basic version of RSS reader. 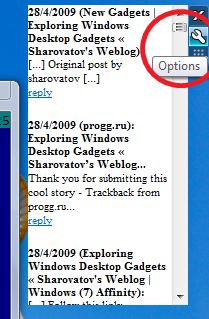 As you may notice, the script doesn’t work on sharovatov.ru. Cross-domain security restrictions is a reason for that – the script is located on one domain (sharovatov.ru) and it tries to request data from another domain (sharovatov.wordpress.com). However, if you save main.html page and rss.js file to your machine, run main.html from IE8 and confirm JS execution, you will see the comments feed displayed. As we’re done with functionality, it’s time to convert our small client-side web-app to a gadget. All we need to do now is to add a special manifest file. 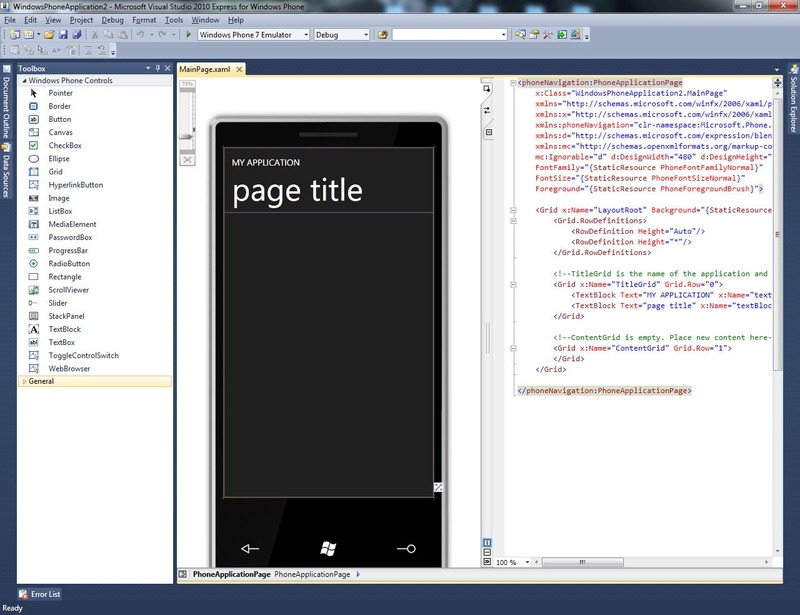 It’s just an XML file with your gadget description. Here’s mine. That’s all. Now we pack these three files into a zip archive and rename its extension to .gadget. Here’s a link to what I came up with. Save it as test.gadget and double-click on it. If you then confirm gadget installation prompt, it will appear on the screen and the feed is downloaded and displayed. Stay tuned and we’ll proceed. Cool, I just found out that great accelerators feature that’s been introduced in IE8 is a part of Windows 7 API as Accelerators Platform. The whole concept is really useful – Accelerators Platform provides a unified way to enhance an text-operating application with cross-application plug-ins. So it’s like a plug-in platform for text selection plug-ins where plug-ins are application independent and stored in one place, so if an accelerator is installed once, it will be available in any application that supports Accelerators Platform. you as an application developer don’t have to maintain a list of supported text selection plug-ins – they can be found and installed easily from here – the list of accelerators is huge! if you want to create your own accelerator for your application, it’s well documented and dead easy – I’ve created 6 accelerators just in 20 minutes! Or your users can do it! So by supporting Accelerators Platform in your app you allow users to do with the text whatever they like and whatever they are used to! 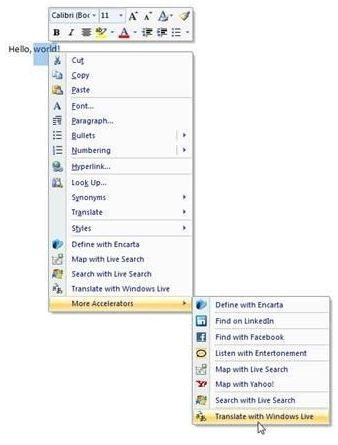 Just imagine – wouldn’t it be wonderful to be able to select address in any application, right click on it and see where it’s located on the map? Or select unknown word in any application and see its definition in Wikipedia? Or select a function name that you’d like to refresh you memory about and see what php.net or msdn have to say? Or select any text and translate it to other language in one click? Or check how much selected TV model costs on ebay? For more details and technical description of Accelerators Platform please visit this MDSN article and this IE Team Blog entry. So go and support Accelerators Platform in your app!